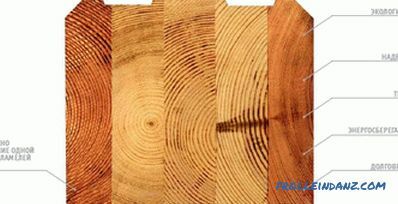 Entrance and interior doors have not only protective, but also decorative functions. The design of the doors is chosen in accordance with the interior of the dwelling, the constituent elements of the doors should not be in conflict with the artistic style of the premises. 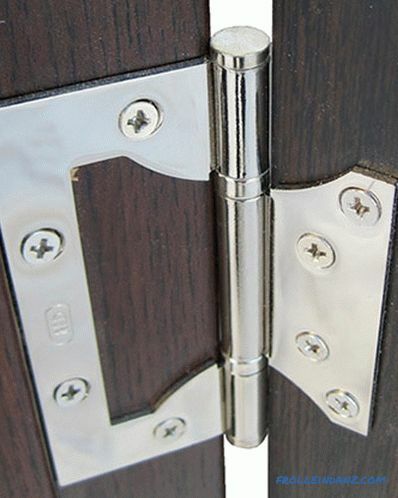 Great importance is attached to the choice of types of door hinges, because poor selection of canopies can ruin the appearance of the entire doorway, provoke misalignment or sagging of the door leaf, cause a lot of inconvenience due to poor closing of the doors in the box or annoying creaks in the loops. It should be clarified that the need for self-selection of canopies for doors affects entrance and interior doors made of wood or MDF. Doors from other materials (steel, aluminum and plastic) are supplied already completed with appropriate fittings and hinges. 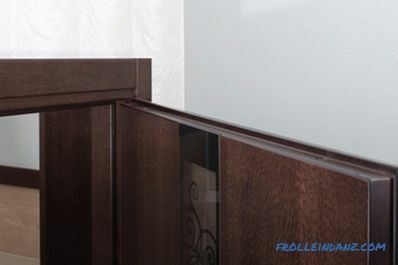 Only for door doors of wood there is a need and the possibility of self-assembly and installation of hinges in its sole discretion. Therefore, the classifying signs of door hinges will be considered in projection on their use in the composition of wooden doors. Entrance doors are more durable and massive than interior doors, respectively, and awnings for entrance models differ from their counterpart interior counterparts in larger sizes. 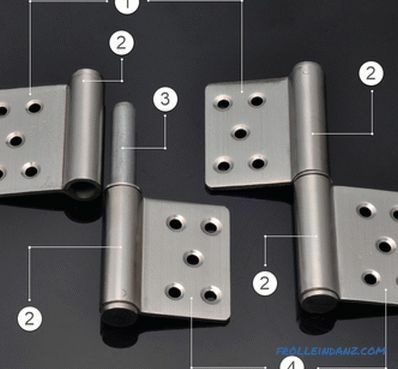 The main structural difference between the hinge fittings for the entrance doors is to equip the hinges with a special mechanism for countering the sash, which prevents unauthorized lifting of the door. 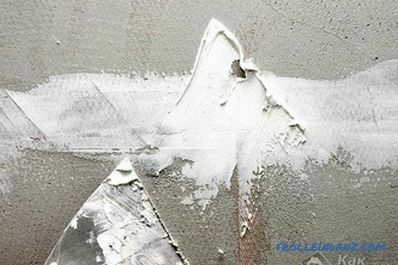 For this purpose, protrusions and depressions are made on the wings of the hinges, which are combined with the door closed, preventing the wing from moving vertically during lifting. 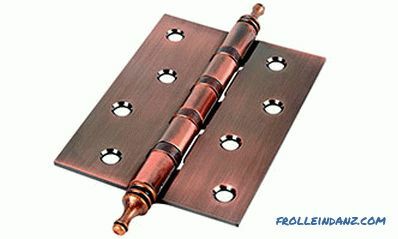 A split hinge allows you to remove the sash without unscrewing the hinge itself. 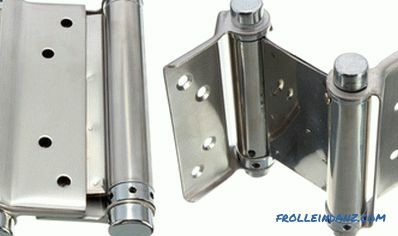 Removable hinges in everyday life are also called canopies. The figure shows a split loop diagram illustrating the principle of separability. The elements of fixing both parts of the loop in everyday life were ingeniously called "dad" and "mom." This terminology is readily acknowledged by both users and manufacturers in many countries. 1. Hinge door wing (mom); 2. Fist; 3. Reinforced steel finger; 4. Frame wing (dad). The universal (or one-piece) hinge will have to be unscrewed before it is possible to remove the door from the box. 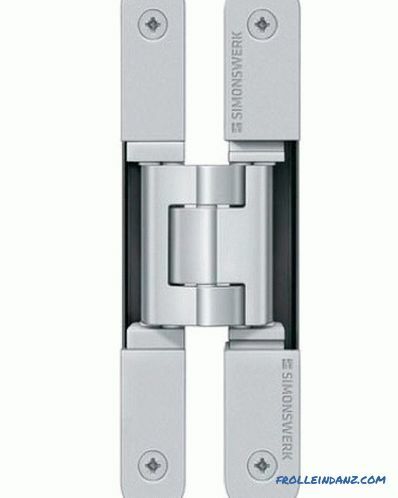 Universal hinges are suitable for any doors that open both inward and outward. But to this big plus is added the same big minus - if necessary, the door will be removed only after unscrewing all the hinges from it. 1. The frame wing, has three hinges; 2. Sleeve; 3. The door wing has two hinges; 4. 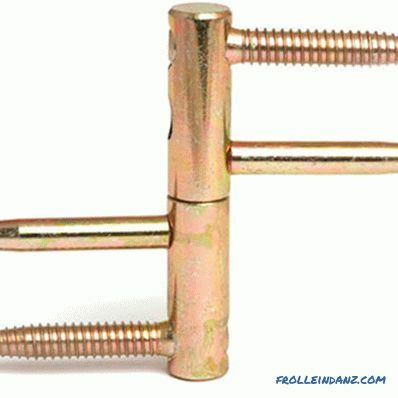 Self-tapping screws for fastening. 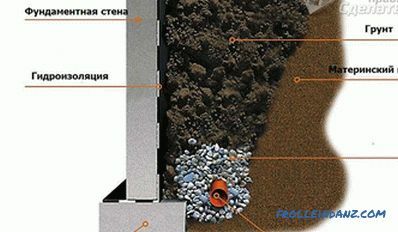 Consider in more detail each construction. for mortise models it is necessary to cut a recess in the end of the door and in the box to drown card plate. Overhead hinges have been known since ancient times, their manufacture was entrusted only to skilled blacksmiths, who could forge a beautiful and at the same time durable product from a steel strip. That symmetry, which in our time is imposed on the mass consumer by the conditions of modern conveyor technologies, was not allowed by manual work. Loops were forged very large sizes, they were attached to a diverse form. The process of transforming design concepts into retro style also affected door hinges.In the interiors of country houses and city apartments stylized as antiquities there is a place for the artistic forging of modern blacksmiths or products that resemble loops of old buildings. 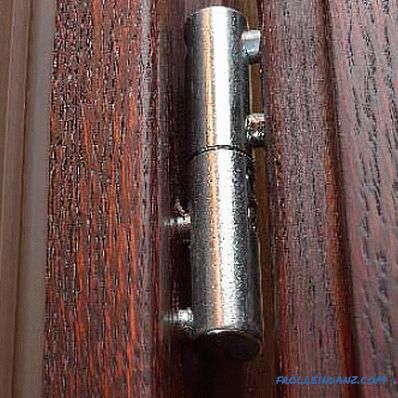 Owners of doors with patch hinges are impressed by the ease of installation work during their installation, when the hinges are fastened with screws and the door is easily put into design position with the help of primitive improvised means. An interesting design solution for the traditional flat card of the invoice loop that has already become traditional is the invoice loop, commonly known as the butterfly loop. Such a loop is able to fold to the thickness of a single card due to the cut of an intricate shape resembling a butterfly wing. As a result, under this model of canopies there is no need to make a selection either on the sash or in the opening on the box. Mortise models of canopies are identical in construction with the overhead, but to install them, the hinges cut into the end of the mounted door and screwed with screws. 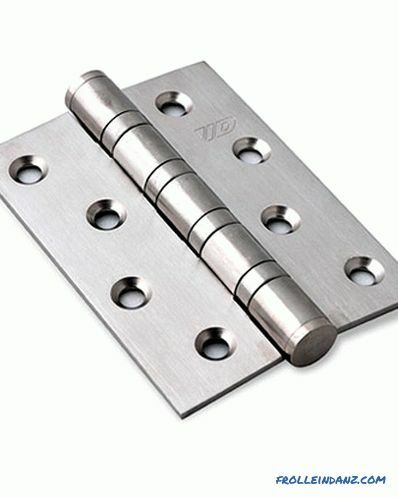 When the door is closed, only the parts of the plates closing the turning axis are visible. 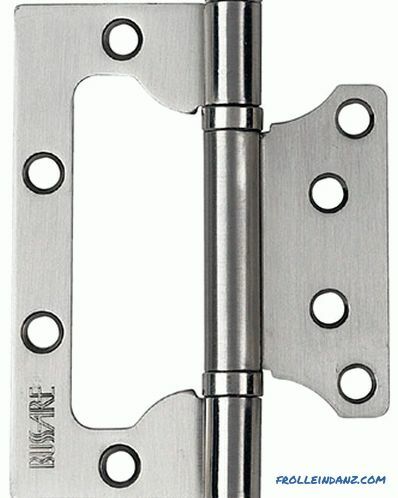 In accordance with established practice, it is accepted to call removable mortise hinges as mortise canopies, and universal ones as mortise hinges. 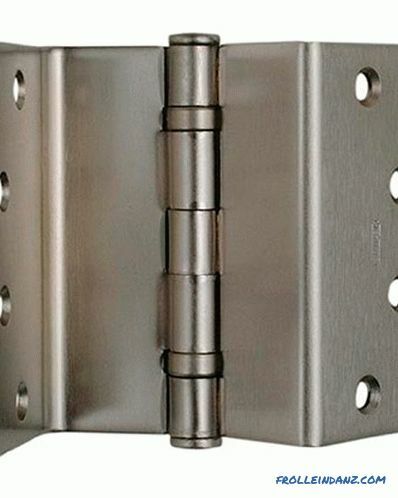 The main difference between overhead detachable hinges from universal ones lies in the rigidity of the design of the universal hinge, which allows it to withstand a greater weight load at a smaller size. When using universal loops, there is less chance of unauthorized sagging in the opening. Another fundamental difference for these two modifications of the overhead hinges is the separation of the split canopies into right- and left-sided mechanisms. For universal loops there is no such separation. They are installed without worrying about the direction of opening the sash. 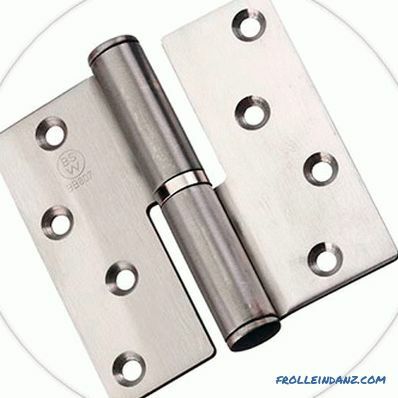 Screw-in designs of door hinges are represented by two symmetrically arranged parts of a cylindrical shape with holes for mounting screws. The so-called "kegs" are functional analogs of flat maps. One "keg", that is, a cylindrical wing screws attached to the box, the other - on the door leaf. Screw-type loopback mechanisms are universal, there is no need to select right or left loops. 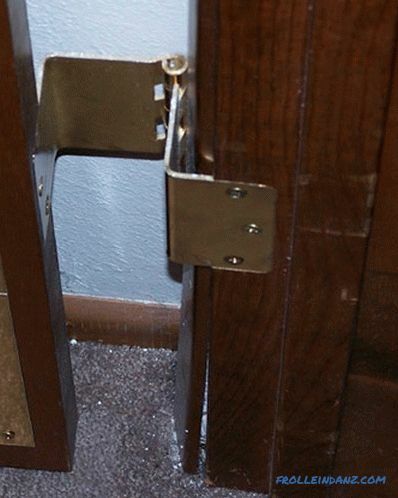 The door on the screw hinges will not be removed, which can be considered both a virtue and a disadvantage. This is important! Screw canopies are applicable only on doors with euro-viewer (the so-called doors with a quarter). The usual door leaf of our standards for such hinges can not be fixed. 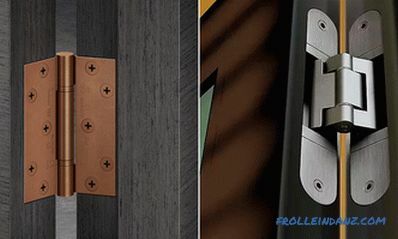 The external difference between a corner hinge and a laid-on or mortise - mounting to the axial rod is not two flat wing plates, but two profile corners. The angular shape of the cards allows them to be mounted on the door with a porch. 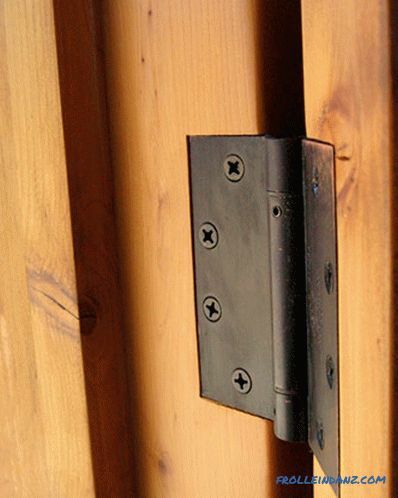 Fastening to the end of the door is done in a mortise way to the screws. 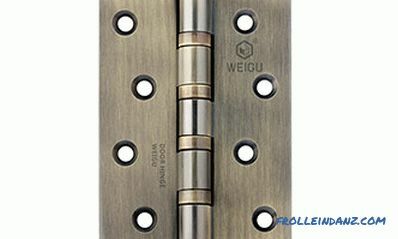 The hinges fit comfortably in the opening, but they are noticeable against the background of the entire door structure. Hidden hinges have a special place due to aesthetic appearance the doorway (with the door closed, the hinges are completely invisible) and the impressiveness of the performance. They are universal, you don’t have to wrestle with which loops are right and which are left. In the sector of elite interior design they are given a place of honor. The design of hidden (secret) loops assumes the presence of at least three rotary axes. The installation of hidden loops is a complex technological process, for the implementation of which it is more expedient to involve specialists. Double-sided hinges belong to the category of card shelters. Their main purpose is to ensure unobstructed openings / closures of the valves in both directions, either outward or inward. In ordinary apartments they are installed extremely rarely, their use there is simply not logical. 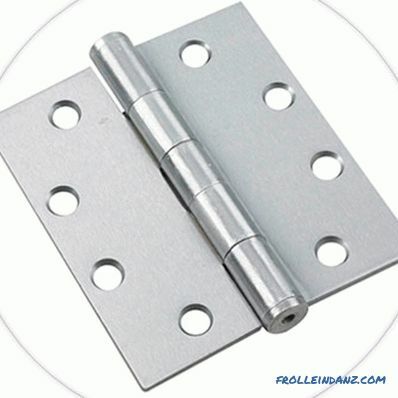 Materials for the manufacture of door hinges do not differ in wide variety. Steel products return their former demand. Centuries ago, blacksmiths had perfected the manufacture of steel forged overhead hinges, but the development of the production of aluminum and brass alloys overshadowed the use of steel for artistic door hinges. In the Soviet era, steel was used to make ordinary consumer goods of a dull appearance without any decorative or anti-corrosion coating. Now the installation of such sheds on interior doors is not practiced, they are more used on street fences or in non-residential premises. For installation in apartments, the modern market of door fittings offers semi-antique forged hinges or stainless steel sheds. The main advantage of steel products - high rates of mechanical strength and not abrasion. Stainless steel hinges are resistant to the negative effects of moisture and temperature, so they are willingly used for entrance doors. Thanks to the efforts of interior designers, canopies covered with enamels or special "under gold", "under bronze" compositions, chrome-plated or coated with brass, are widely used. 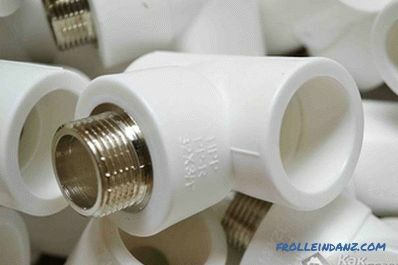 They are based on alloys of aluminum, copper, zinc or steel, which are then coated for anti-corrosion and decorative purposes. 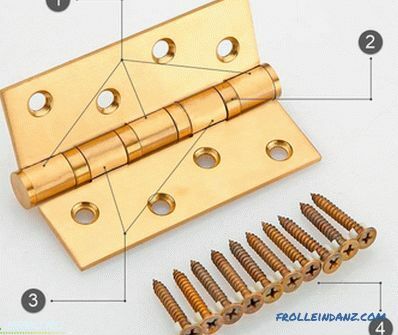 The leading global brands for the production of door hardware instead of brass hinges are made entirely of brass. Such products are easily polished and retain their decorative qualities for a long time. 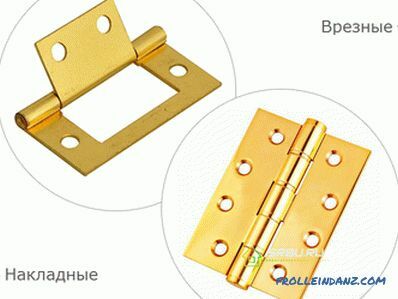 For wear resistance brass products are not inferior to steel counterparts. 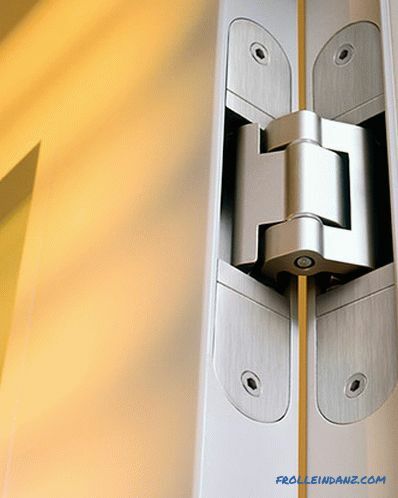 It is impossible not to mention the materials of counterfeit products that flooded the market of door hardware. The loops that externally imitate popular brands, but have nothing in common with them, are made of materials produced by powder and other technologies. Counterfeit loops can unpredictably collapse at any very inopportune moment, creating a direct threat of injury to others when the sash collapses.